In 1967 The Beatles had their fourth and last Xmas no. 1 with “Hello, Goodbye”. The B-side to this single was “I Am The Walrus”, which I personally prefer to the A-side. “Hello, Goodbye” was released on the 24th of November, perfect timing to try to get the Christmas number 1 slot. It is at number 100 in Rolling Stone Magazine’s list of the 100 greatest Beatles songs, but as I started at 50 in the countdown I am currently doing of this list, I have not yet blogged about it separately. 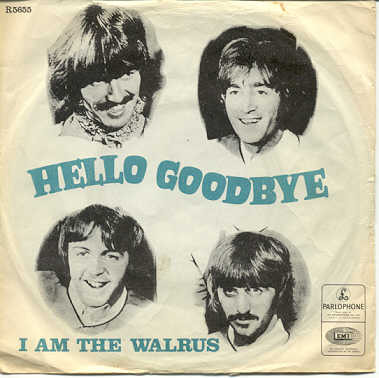 “Hello, Goodbye” spent 7 weeks at the top of the DUK singles charts. Here is a video of this song. Enjoy! 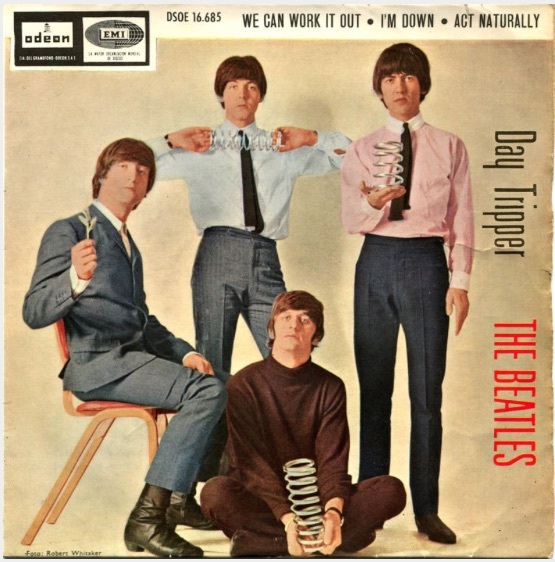 In 1965, the Beatles had the UK Xmas number 1 with their double A-sided single “Day Tripper”/”We Can Work it Out”. I am a big fan of both of these songs, particularly “We Can Work it Out”. They were released on the 3rd of December, perfect timing to try to get the coveted no. 1 Christmas slot, which they succeeded in doing. I have blogged about “Day Tripper” here, as it is at number 39 in Rolling Stone Magazine’s list of the 100 greatest Beatles songs. “We Can Work it Out” is also in the list, but I am yet to blog about it in my countdown. This double A-sided single was released on the 3rd of December 1965. It was number 1 for 5 weeks in total. Here is the cover of the UK release of the single. Here is a video of “Day Tripper”. Enjoy! Here is a video of “We Can Work it Out”. Enjoy! In 1964, the Beatles again had the number 1 single at Xmas in the UK. This time, it was “I Feel Fine”, which is one of my favourite Beatles songs from their early era. I have already blogged about this song here, as it is at number 42 in the Rolling Stone Magazine’s list of the 100 greatest Beatles songs. 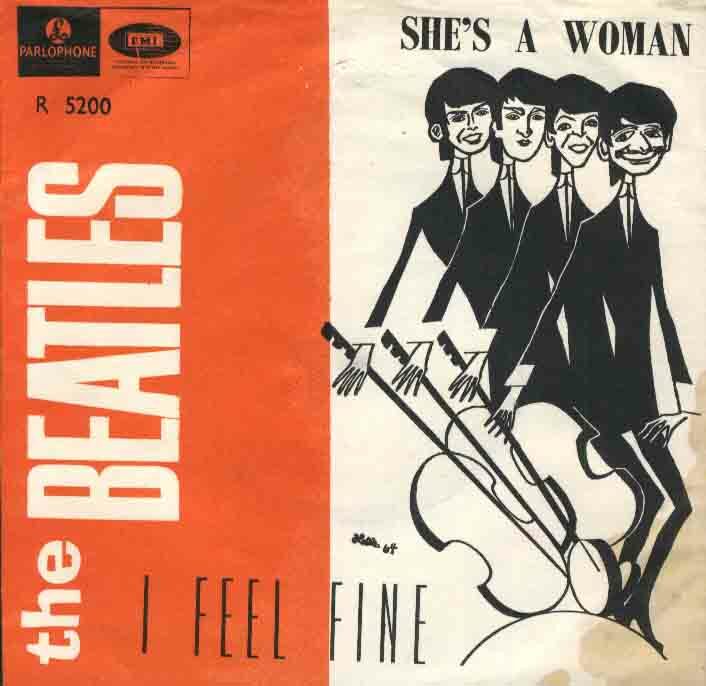 “I Feel Fine” was released in the DUK on 27th of November 1964. It was at number 1 for a total of 5 weeks. I am not sure if the image below is the cover for the UK release of this single, but I really like it so thought I would use it, rather than all the other covers which I found when searching. In the lead-up to Christmas, I thought I would do a series of blogposts about the 4 UK number ones the Beatles had at Christmas. More so than in the USA, the number 1 at Xmas is quite a big thing in the DUK, and the Beatles were keen to have that slot each year. They succeeded in 1963, 1964, 1965 and 1967. In 1966 they did not release a single after the August release of double A-sided “Yellow Submarine/Eleanor Rigby”, in 1968 their last single release of the year was “Hey Jude”, which was released in August, and in 1969 their last release of the year was the double A-sided “Come Together/Something”, which was released in late October. So, it would seem that in the years where they released a single for the Christmas number 1 slot, they succeeded. The 1963 song they had at number 1 was “I Want to Hold Your Hand”, so that is the song I will include today. 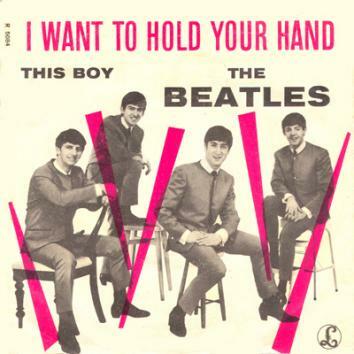 “I want to Hold Your Hand” was released in the DUK on 29th of November 1963. It was at number 1 for 5 weeks in total, and in fact took over the number 1 slot from “She Loves You”. This is, I believe, the cover for the UK single release, but I may be mistaken. Does anyone know? “I Want to Hold Your Hand” was the Beatles’ first Christmas number 1 in the UK. I will be blogging about this song again in my countdown of the 100 greatest Beatles songs as listed by Rolling Stone Magazine, so I won’t include the details of the song or its lyrics here. But, here is a video! At number 19 in Rolling Stone Magazine’s list of the 100 greatest songwriters is Jeff Barry and Ellie Greenwich. Now, I have to admit, before putting this blog together I would not have been able to name any songs written by this pair, I was unfamiliar with their names. I am not sure why this is, as I had certainly heard of Leiber and Stoller, another songwriting pair who wrote many hit songs for various artists (and who are at number 20 in this list, see here). But, as soon as I looked up some of the songs which Barry and Greenwich had written I knew many of them, they are one of the most prolific songwriting teams of the early 1960s. Their hits include “Be My Baby” and “Baby, I Love You” by The Ronettes, “Then He Kissed Me” and “Da Doo Ron Ron” by The Crystals, “River Deep – Mountain High” by Ike and Tina Turner, and “Do Wah Diddy Diddy” which was a number 1 hit for Manfred Mann on both sides of the Atlantic. Greenwich and Barry also wrote the Shangri-Las’ hit “Leader of the Pack”, amongst many others. At number 19 in Rolling Stone Magazine’s list of the 100 greatest songwriters of all time is Ellie Greenwich and Jeff Barry. Barry and Greenwich met in late 1959. By this time Barry had recorded a few singles for the RCA label, and co-wrote the song “Tell Laura I Love Her” with lyricist Ben Raleigh (which was a hit for Ray Peterson in 1960). Barry and Greenwich shared a mutual passion for music, but their professional relationship eventually became a romantic one too, and they married in October 1962. Unlike Leiber and Stoller, it would seem that Barry and Greenwich’s songwriting partnership involved both writing both melodies and lyrics. Barry and Greenwich’s marriage ended in late 1965, but they continued to work together throughout much of 1966. The song I have decided to include in this blogpost is the one which propelled Manfred Mann to stardom, “Do Wah Diddy Diddy”. This was released by Manfred Mann in July of 1964, although it was originally recorded by an American vocal group called The Exciters. Here are the lyrics to this great song. And, here is a video of Manfred Mann performing their first number 1 hit. Which is your favourite song by this prolific songwriting pair? The European Space Agency’s JUICE mission to Jupiter moved a step closer recently with the signing of an important contract between ESA and Airbus. JUICE stands for JUpiter ICy moon Explorer, and is an ESA mission to send a probe to explore Jupiter and her moons, with a launch date of 2022 and an arrival at Jupiter in 2029. The contract signed with Airbus will see them lead the development and construction of this satellite. There will also be some involvement from NASA and the Japanese space agency JAXA. Upon arrival at Jupiter, JUICE will manoeuvre to achieve close passes of its moons Callisto and Europa, before settling into orbit about its largest moon Ganymede. Ganymede, together with Europa and possibly Callisto, is believed to have a liquid ocean beneath an icy crust. Airbus have recently signed a contract with the European Space Agency (ESA) to lead the construction of JUICE, a probe which will be sent in 2022 to study Jupiter’s moons. The main focus of the JUICE mission will be to see how habitable Ganymede is for microbial life. With liquid water, and heating from the tides caused by Jupiter’s tides, Ganymede, Europa and Callisto are believed to be amongst the most likely places in our solar system for life to have developed. Longer term plans are to build a probe which will be able to burrow through the icy crust of one of these moons and actually look directly for life in their oceans. At number 35 in Rolling Stone Magazine’s list of the 100 greatest Beatles songs is “Paperback Writer”. This song was written mainly by Paul McCartney, with some contribution from John Lennon, but as usual is credited as Lennon-McCartney, as all their songs were during the Beatles period. It was recorded in April 1966, and released as a single in May (USA) and June (DUK) of the same year. It was the A-side of the single, with the B-side being Lennon’s “Rain”. To be honest, this is not one of my favourite Beatles songs. In fact, I much prefer “Rain”, it is a far more inventive and interesting song in my opinion. Although “only” a B-side, “Rain” also features in the Rolling Stone Magazine’s list of the 100 greatest Beatles songs, at number 88. At number 35 in Rolling Stone Magazine’s list of the 100 greatest Beatles songs is “Paperback Writer”. 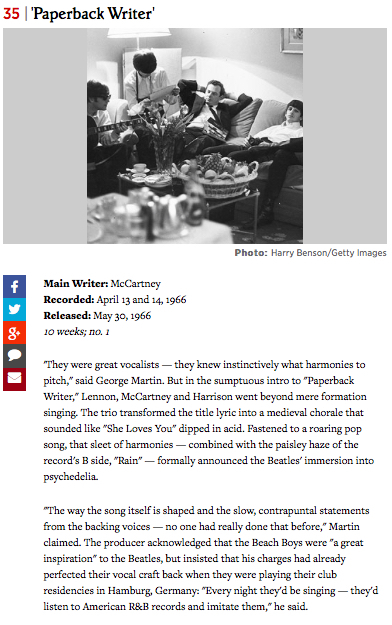 If you read the caption to the song, George Martin (their producer) certainly praises the song highly. But, as I say, this is one of my least favourite songs of theirs from 1966, and I am a much bigger fan of the more psychedelic “Rain”, the B-side to this single. The first video I have included here is the entire song. But, this second video is a colour video of the Beatles performing the song. They were one of the first bands to release videos, as they did not have time to make live appearances to promote their songs on TV shows. Unfortunately, this YouTube clip is not the entire video, just the first minute of the song.